In this fast-paced, capitalist world we live in, weâ€™ve figured out the best way to tap out and resist: be more sloth. Sloths are animals best known for their slowness and spending time hanging upside down from trees in tropical rain forests. 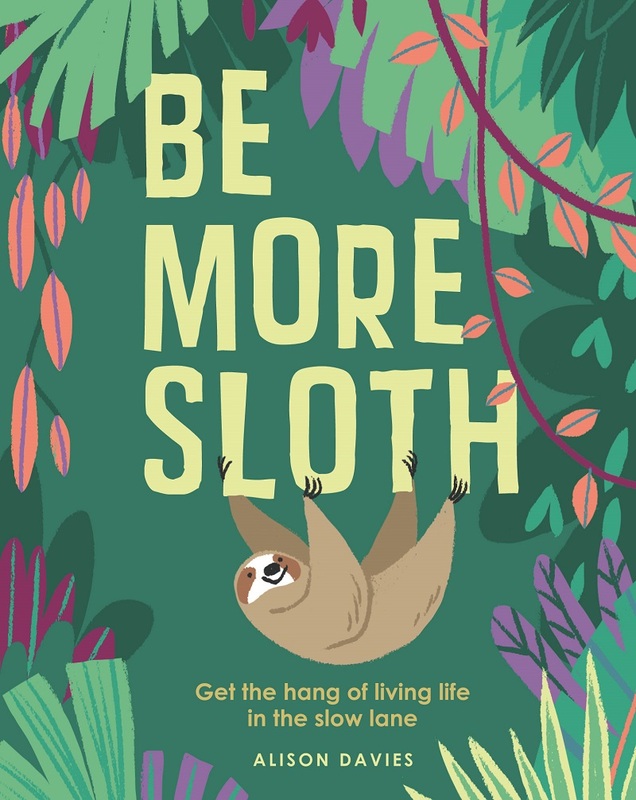 In Alison Davies’ new book Be More Sloth (which releases in August), she shows how lessons from the sloth can help you lead a happier, healthier and more chilled existence. 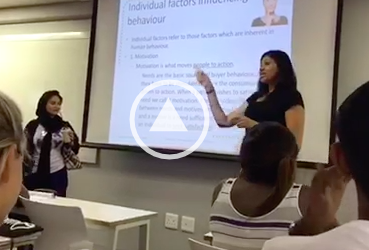 SHAAZIA EBRAHIM and FATIMA MOOSA round up the seven ways to be more sloth-like. In the world we live in, sometimes taking a break can make you feel guilty. Taking a break can feel counterproductive. On the contrary, resting is good for you. Itâ€™s good for your health and itâ€™s good for your wellbeing. Quit rushing and start living. Take a deep breath, go for walks with yourself (and not just for the Instagram pictures! ), eat slowly for better digestion, watch your favourite TV show without checking your phone. Be patient. So much energy is wasted rushing and worrying about things you canâ€™t control. Relax, youâ€™ll feel better we promise. Change your perspective. As you know, sloths are often hanging upside down from trees. What does that mean? They see things differently. Many times things happen that can seem like the end of the world. But if you pause, and look at them from a different angle you can see all the options and opportunities in them. While youâ€™re at it, look at yourself differently. Youâ€™re a marvelous person with a wealth of skills and talents. Use them. Quit negativity and looking at things from a perspective that doesnâ€™t serve you. Life is a funny thing. There are twists and turns where you least expect them. Another lesson from sloths? They endure. There’s no use reveling in the drama and complaining. Take each day as it comes with more calm and less fuss. Accept your mistakes and your failures, don’t compare your struggles and wins with others. Above all, be tenacious. Living a life hanging from trees like the sloth looks easy because it is. Hang in there, everything will be okay. The sloth is the creature of gentle benevolence. 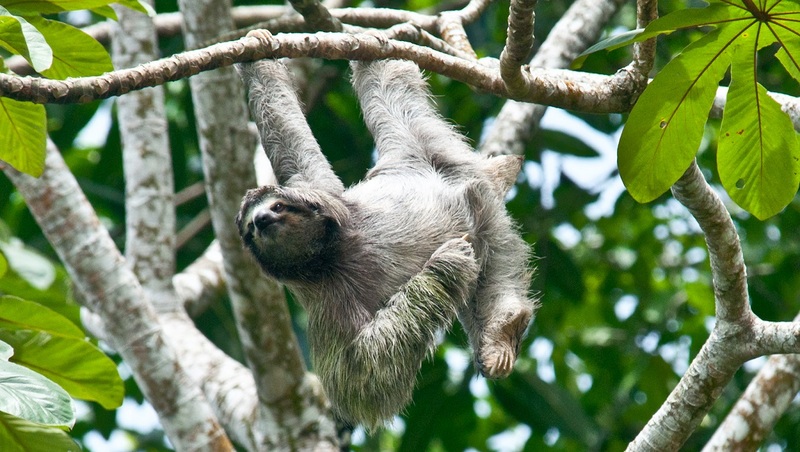 Like a walking (or hanging) ecosystem, sloths host algae that grow in their hairs and shelter a specific type of moth that lives in their fleece. Sounds a bit gross but there’s power in kindness and working together to survive. Do something for someone else: say a kind word, offer your time, lend a hand. Appreciate others and learn from them. But importantly, be kind to yourself. Offer yourself kind words and encouragement, acknowledgement and time. Spend time with yourself doing things you enjoy. Kindness is a currency, deal in it. We canâ€™t all be good at everything but the trick is to find out the thing that you are good at. As human beings we like to complain about what weâ€™re bad at, instead of finding out where our talents lie. Be like the sloth and and find out what youâ€™re good at and more importantly where your talents lie. Take the time for self-discovery and donâ€™t focus on just the negatives of your life. Find the little things in life that give your joy and keep things positive. Sometimes itâ€™s easier to give compliments than to receive them. But part of self care is being to receive compliments and to be the sloth and smile and accept that others love you. Like the sloth, be totally at peace with the world. Life can be demanding but it doesn’t have to be. Take a leisurely approach to life, don’t lose yourself in the superficial, and nurture yourself and your loved ones. Sleep more, rest is not something to feel guilty about. It’s productive. Focus on yourself and how you’re feeling, take deep calming breaths. Smile more, it can trick your subconscious mind into believing you have more things to be cheerful about. The trick is to be zen. Sloths might been seen as slow and quiet but never think of them as predictable. The sloth has a voice and is not afraid to use it. If you get under his skin and the sloth feels threatened, he will make his presence known. And if youâ€™re looking for some women power in the sloth species, the female sloth is oozing with confidence and no-nonsense attitudes. Never hesitate to speak your inner truth and never be afraid of being who you are. Be bold. Be proud. Be you. Find other like minded people who you can connect with and use that space to share ideas and grow. Find your passion, write it down and never stop doing what makes you happy. Be More Sloth will be available for in bookstores and online by August 21. Featured image via Flickr , book cover image via Jonathan Ball publishers.